What a sight! The American Bungalow. The Classic American Bungalow! The staple of the middle class in almost every city in the U.S., from 1890 to the 1930s! Who would have ever thought this name ‘morphed’ from India? The story goes that while the British in their colonial days were in India, the Hindi “bangla” became the word for a certain type of house in which Bengalis lived. Then the English pronounced it wrong (maybe on purpose) and it became bungalow. In North America, a bungalow today is a detached residential house, which is either single story or has a second story built into a sloping roof, with dormer windows. 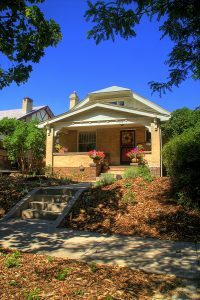 Denver has no shortage of these delightful vintage homes, and many are even considered Denver Luxury Homes now. As you drive and see these nostalgic old homes, it is apparent that there are many owners and aficionados of this home style, who are dedicated to their preservation! There is even a publication called, not surprisingly, The American Bungalow, with every kind of historic bungalow information for its adherents! There is a second Bungalow search below for homes built after 1940, as Bungalow homes were so very popular! Check it out and you may find your next home here!